Full-time writing can be a feast or famine profession. Many writers dabble in it, and do not earn more than a few hundred dollars per year on their work, while others are pulling in six and even seven figures if they hit the big time. According to Publishing Perspectives and a 2014 Digital Book World and Writer’s Digest Author survey, more than 77% of self-published writers pull in $1,000 per year. In addition, 53.9% of traditionally published authors and 43.6% of hybrid authors earn around the same amount. Only 0.7% of self-published authors, 1.3% of traditionally published authors and 5.7% of hybrid writers bring in more than $100,00 per year. Getting into the top-earning percentile takes dedication, a belief in yourself and an internal drive to constantly improve. 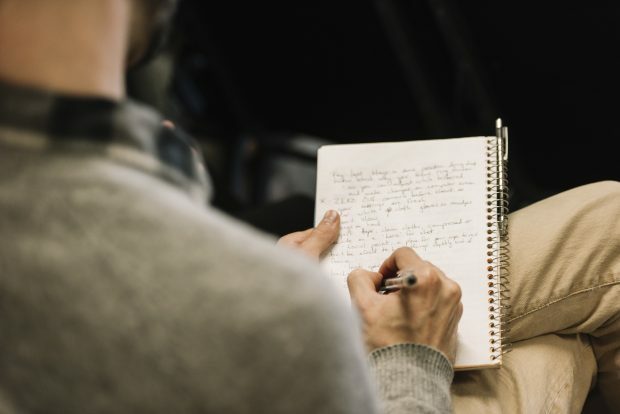 If you want to transform your writing ambitions into a successful endeavor, you can take the following steps and advice into consideration. When you start writing, do not worry about what the audiences will want. Instead, speak your truth. Be authentic and write about what moves you, and include your worldview in your writing. You will find audiences that relate to your work and appreciate your raw honesty. If you try to go after what is trending or create solely for the purpose of making money, you won’t get anywhere. To figure out what your worldview is, fill in the blanks of the following: “Every [people group] can/should [action].” You may say, “Every person should give to the poor” or “Every woman should go to college.” A worldview can be specific or general, obvious or not. Above all, it needs to live underneath the surface of everything you write and be the reason for you’re writing. Any creative profession requires people to think outside of their boundaries and test their limits in order to grow. If you are a journalist, try your hand at fiction. If you write screenplays, come up with an idea and produce a book. If you always stick with one genre of writing, there is a possibility that your work will stagnate at some point. Switching it up and trying something new is going to prevent that from happening. You will not get anything right the first time around. Thriving writers are constantly rewriting their work one, two, three or four or more times. Every piece that you write should take several hours and a few drafts before you get it right. Do not accept first drafts. Take the time to edit your work and make it even better. You may be waiting for a publisher to say “yes” to you. In the meantime, you should self-publish your work. Get it out there. You can start a blog, publish an e-book or release a full-length book through a self-publishing house. Instead of sitting around and refreshing your emails, eagerly anticipating contact from publishers, follow through and do it on your own. Being an entrepreneur means finding your tribe. Email is the king of marketing because it is personal and builds trust. It is also the best way to reach people, since they are checking their emails several times a day. Goins once released a book that sold 15,500 copies within the first two weeks. Five hundred of those sales came from social media, while 15,000 were from email. Practically speaking, you need to find a solid email marketing service, create a good looking signup form for your website and email your subscribers something new every single week. Once you build up your email list, it is time to introduce yourself and your worldview by putting out a manifesto. When people read it, they should get a deep understanding of who you are as a writer. On social media, you can only communicate bite-sized messages. A manifesto allows you to say what you want in as many words as you’d like. Your manifesto can be a PDF, an e-book or some other long-form document that people can download from your website and/or receive via email. Full-time writing can be a solitary career, but you need to be around others. Make it a goal to meet up with another writer in person at least once a month. If you cannot find any other writers where you live, chat with one online. You are going to make great connections through this type of networking and not feel so lonely in your career and efforts. When you write down your income goals, you are much more likely to accomplish them. Come up with a number and plan to make that much money this year. Then, you can work backwards and construct a path that you can follow and accomplish your objectives. Now is the time to pursue your goals and become a prosperous and prolific writer. It all starts with putting the pen to the paper, or the fingers to the keyboard, and writing from the heart. Do you want to learn how to have a full-time writing career? Register for Jeff Goin’s class, “From Starving to Successful: How to Become a Full-Time Writer” on CreativeLive.